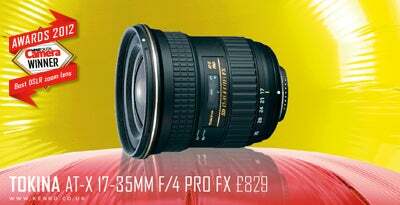 Our DSLR zoom lens of choice for our 2012 awards is Tokina’s AT-X 17-35mm f/4 PRO FX for the way it balances an excellent build quality with a superb optical performance. Scoring a 95% overall score earlier this year, this wideangle zoom produced a staggering set of MTF curves that only dipped below the important 0.25 cycles-per-pixel threshold wide-open at 24mm and 35mm. The exceptionally wide angle-of-view on offer, coupled with minimal signs of distortion, makes it an excellent optic for interior and landscape subjects where it’s vital to squeeze as much as possible within the frame. Designed for full-frame DSLRs and available in Canon and Nikon mounts, it provides everything you need from a wideangle zoom at a sensible price. We have no hesitation in saying it’s one of the best super-wideangle zooms available today.